The reference links below provide centralized and comprehensive information and resources to both consumers and businesses for dealing with identity theft. This crime has been consistently on the rise year after year and has further accelerated in recent years due to the Internet and dissemination of personal information. The challenges as well as the solutions offered by the identity protection market are many which add even more fuel to the identity theft epidemic due to the lack of public awareness regarding identity theft challenges and the appropriate solutions for their unique situations. Identity fraud and privacy disclosures are the undesired consequences of identity theft in most cases. Consumers and businesses suffer the consequences of identity theft in various ways and must use specific strategies for preserving privacy and preventing identity fraud. Our objective is help the society protect the human as well as the object identity through awareness, education, research, technology and analysis. Our goal is to point both consumers and businesses to the specific information and solutions that fit their unique identity protection needs. Consumers should attempt to understand their identity theft risks and identify the most cost effective solutions that provide the best identity protection for their families and loved ones. There are many identity theft challenges and there are also many identity protection services in the market today, however, not one single service provides a comprehensive identity theft solution. We help consumers understand their identity theft risks and define their own identity protection needs through awareness and education allowing them to prioritize and pick the best identity protection services available for their unique situations. We also analyze some services or products and provide free information regarding their usefulness. All articles on the Identity Theft Awareness .com site are free and written by Henry Bagdasarian. Become aware and apply the best identity theft solution that works for you. 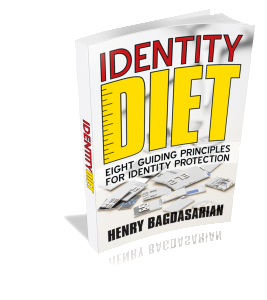 Identity Diet is a personal identity theft risk assessment and identity protection plan. The idea was conceived by Henry Bagdasarian based on the understanding that our excessive collection, sharing and retention of personal information lead to identity obesity. We must collectively understand our identity theft risks and create personalized identity protection plans to properly address our unique identity protection challenges. Visit Identity Diet .com for more information. Companies should be proactive in protecting their customers’ personal information. There are many identity theft risks including identity fraud and privacy disclosure that should worry both the corporate executives and high target identities. Some of the undesired consequences of identity theft might include tarnished image, ruined credit, lawsuits, lost revenue, and penalties from violations of Federal and State regulatory requirements just to name a few. If you are worried about the privacy and protection of your identity or the identities of your clients and employees, visit IdentityMate to learn about your challenges and our solutions. Identity Management Institute (IMI) is established to redefine and promote the identity management field, serve the identity management professionals, increase awareness, and provide identity risk management standards, guidelines, certifications, and education. Join IMI and consider becoming certified.